Sick of spending your weekends on your home turf? Time to schedule in a day trip and explore more of what our incredible part of the world has to offer. Here are the best day trips to take from Brisbane. Beach driving is only the beginning when it comes to the many adventures to be had on Fraser Island with a set of (4WD) wheels. Around a four-hour drive from Brisbane via Hervey Bay (a long weekend will come in handy, here), Fraser Island is home to the iconic Maheno Ship Wreck, the vibrantly-coloured Pinnacles and Lake McKenzie, which boasts the same silica sand as Whitehaven Beach in the Whitsundays. The many islands off the coast of SEQ makes for some incredible day trips from Brisbane and none more so arguably than Moreton Island. Just an hour away by ferry the island is almost entirely declared National Park territory, which means it is largely untouched. From pristine blue waters and beaches, lush rainforest, historical lighthouses and famed natural wonders such as Mount Tempest, the world’s largest coastal sand dune structure, and the iconic Tangalooma Wrecks make Moreton Island the perfect day trip or weekend stay-cay for lovers of the outdoors. The Lockyer Valley is probably best known as Australia’s salad bowl—it's home to some of the most fertile soil in Australia—but it also boasts some epic natural beauty and a winery or two well worth the visit. Start your journey with a stop at Cunningham’s Crest Lookout and be treated to breathtaking views across Laidley Plains. Sip the local vino at Preston Peak Wineryand take in the truly stunning views of the valley below. 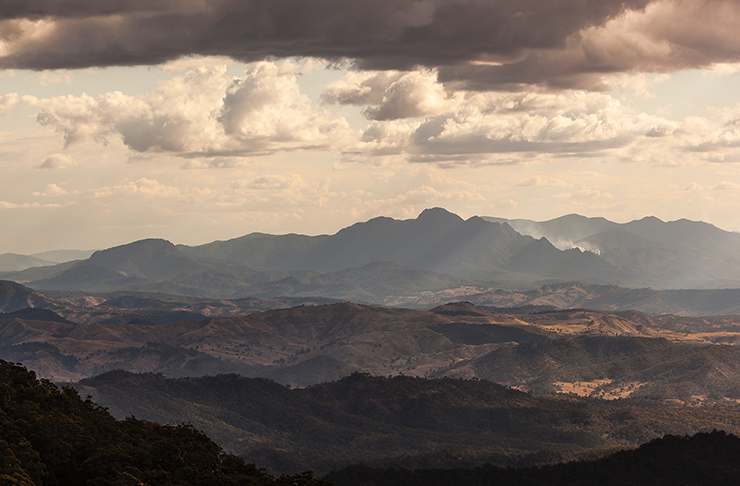 Any list of day trips from Brisbane wouldn’t be complete without a mention of the Scenic Rim. Located only an hour’s drive south of the city, this massive area covers everything from lush rainforests, waterfalls and eco-glamping parks. Start with a walk or hike through the gorgeous Lamington National Parkbefore heading on over to the O’Reilly’s Canungra Valley Vineyards for a mouth-watering lunch. Next, hop on over to Tamborine Mountain to indulge your spiritual side with a shopping spree amongst many of the town’s bohemian shops and cafes. Finally, make your way to Ketchup’s Bank Glamping, via quaint Boonah, for dinner while you watch the sunset over rolling plains. 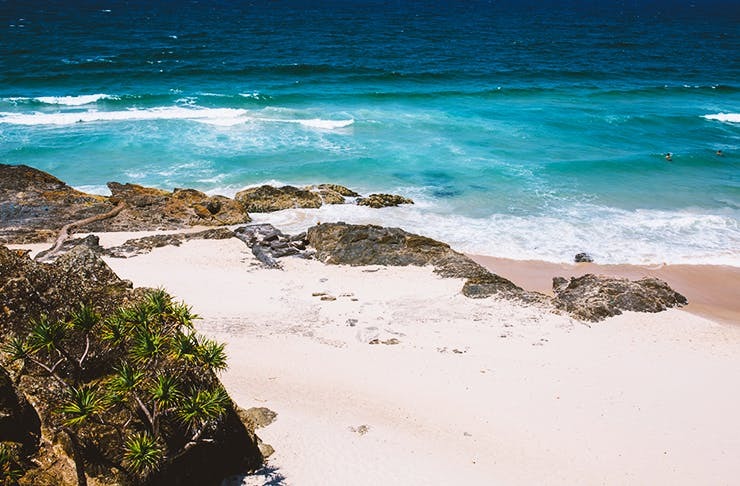 The picturesque island that is North Stradbroke Island is only a 45-minute drive away from Brisbane—making it the perfect day trip location. Highlights of island life include the stunning North Gorge Walk, Brown Lake and Point Lookout, which serves as an excellent spot to watch the yearly humpback whale migration when winter rolls around. More adventurous weekend wanderers might also want to take a shot at sand-boarding or go for a bike ride along the crisp white stretches of Straddie’s many beaches. Montville is the quaint gateway to the gorgeous Sunshine Coast Hinterlands area. Combining European-style stores and cafes, Montville more than deserves its reputation as the creative soul of the region. Start your day with brunch at one Montville’s pretty cafes, before taking a hike through Kondalila National Park—home to a beautiful waterfall and rock pools perfect for swimming. Hop in the car and head south to Baroon Pocket Dam, a beautiful and incredibly peaceful lake tucked between Montville and Maleny that will serve as the perfect picnic spot. Get outdoors and get active by spending the day exploring Mount Warning. The 8.8km Summit Walk should take around five hours and, at the top, you're rewarded with incredible 360-degree views stretching from the Gold Coast to Byron Bay. Do the hike early, to catch the sunrise, then drive down to Byron Bay or a Gold Coast cafe for a big breakfast, coffee and a morning spent exploring local farmers markets. Hop a ferry from the Victoria Point Jetty to get over to Coochiemudlo; it only takes you 10 minutes to get across to Coochie and should only cost around $4 each way. Once you’re there you can set up camp at one of the beaches, set up a picnic, host your own BBQ or hire a bike and explore the island yourself. It takes around 45 minutes or so to get from the heart of Brisbane out to Samford, but it’ll feel like you’re a world away on this perfect day trip. Once there, visit one of the great local cafes or restaurants in the area, then continue the drive to Mount Nebo or Mount Glorious. Stroll through the bushland, have a leisurely afternoon picnic or check out some of the great local shops, selling everything from sweet treats to books, vintage goods and arts and crafts. For the committed Brisbane day-tripper, load up your car and drive the 3 hours north, to Rainbow Beach. You can spend the day swimming, fishing and snoozing in the cool shade of trees near the water then head up to one of the local restaurants for lunch and drinks. Be sure to take a trip up to the mind-blowing beautiful Carlo Sand Blow, one of the most beautiful spots in the whole state. If you have the time, be sure to stick around for the sunset here, it’s something to behold. Probably one of the best day trips from Brisbane, Springbrook National Park offers you amazing scenery and plenty of places to explore, not to mention the insanely good views. Be sure to visit the Purling Brook Falls, Canyon Lookout, Wunburra Lookout and the amazing Best Of All Lookout. Here you’ll find panoramic views stretching across both Queensland and New South Wales. Finish it all of with lunch, drinks and enjoy your relaxing day spent out in nature, soaking in the fresh air. Jump in the car and take the 1.5 hour drive west from Brisbane to Toowoomba. It turns out, Toowoomba has quietly been cultivating an amazing food scene. You’ll find so many great restaurants and cafes as well as a slew of amazing thrift stores for savvy shoppers. Explore the local shops, immerse yourself in stunning views, go for a hike or drive through farmland. A slightly bigger commitment, but well worth a day trip, you’ll find Stanthorpe offers up the perfect winter escape. Visit art galleries, the Granite Belt Brewery, take a trip to the beautiful Storm King dam, visit wineries and Suttons Juice Factory too. If you like to get active, try a hike through Girraween National Park. If you plan on visiting in spring, be sure to stop in at the amazing lavender farm. Drive south to Canungra, grab a bite to eat then head into the Lamington National Park. You’ll find a whole host of walking trails and towering trees just waiting to be explored. Follow the winding road all the way to O’Reilly’s Rainforest Retreat and do the treetop walk, climbing up to the top of ancient figs for stunning views. Fancy taking it easy? Hit up the best cinemas in Brisbane for the ultimate chilled out day.